Fourth of July Recipes Round-up! Fourth of July is always a fun time to celebrate with friends and family. Whether you’re looking for the perfect red, white and, blue beverage, appetizer, or dessert – we’ve got you covered! 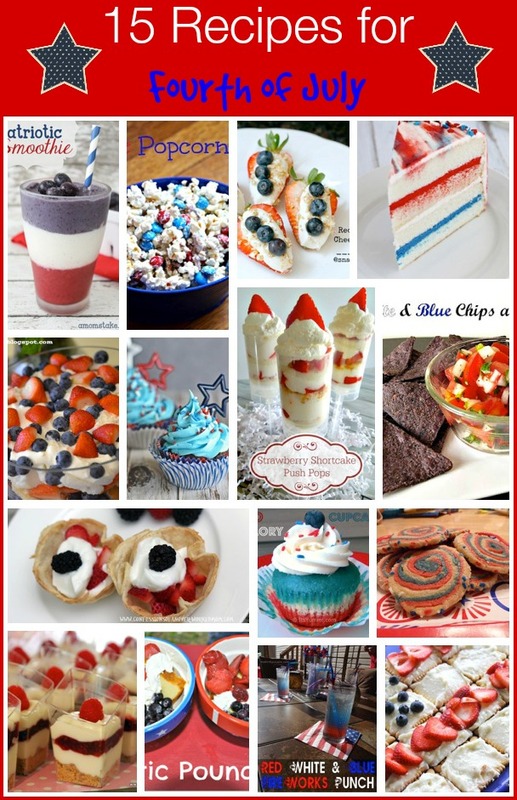 Check out these Patriotic recipes below! How will you be celebrating Fourth of July this year? Or better yet – which recipe will you be celebrating with? Thanks for featuring my recipe, Jennifer! Have a happy & safe 4th of July! You are very welcome! You as well. The popcorn looks so cute. Thanks for the recipe. The pinwheel cookies look impressive and surprisingly easy to make. Thanks for sharing all these festive summer recipes! wow this gives everyone a lot to try! 🙂 yummy! Yes! I am hosting the 4th this year and I am definitely looking for fun recipes. Just pinned so I can refer back to it. Thanks! Years ago I made some fun 4th of July jell-o. These are great ones, since I’ll actually be off work on the 4th this year! My nephew was born on July 5th, so we almost always end up celebrating at a birthday party. Love the dessert ideas. Lots of great ideas here! Thanks for the round up! Those look awesome! I have to plan for a barbecue this weekend so now I have lots of ideas and cannot decide what to make! These look amazing! Thank you for this wonderful roundup! Wow these are some amazing looking desserts! I need to step it up 😉 Thanks for sharing all of these!